How to create meaningful corporate jewellery? Many companies use promotional items for gifts to potential clients or business partners. It can be something really small and cheap, a logo pen for instance, or something more substantial such as a quality umbrella with a logo. These gifts in essence are just basic marketing tools to enhance brand awareness. If you get a nice umbrella as a thank you for purchasing something you will be more likely to use that business again. We can say that your customer satisfaction increases. However, if you are presented with a gift pen after you buy a new car then this might have quite an opposite effect on your satisfaction level. The same applies with work relations. If someone has worked for the company for 10 years, they would most certanly be offended if given a voucher to the local spa. Not only does it show that no effort has been made, they might also get a sense that they are not valued by their peers or bosses. Looking for a perfect gift for that special someone is really hard. Quite often the assistant is given the task to find a nice and valuable gift for an important business partner or for a long serving employee. It is very time consuming and ideas run out pretty quickly. To overcome the problem of gift hunting every time there is a need for one, many companies use custom made corporate jewellery. Corporate jewellery, like bespoke cufflinks or tie clips are designed and manufactured based solely on your specific needs. Corporate jewellery is unique in the sense that it can not be obtained from a shop. Most popular items for corporate jewellery are cufflinks, tie clips, bracelets, neckpieces or brooches. 1) The jewellery must be somehow linked to the company. Either using colors, logo fragments or other symbols that can be associated with the company. 2) The presenter must be comfortable in the knowledge that the recipient of the gift will see the value and the effort that has been placed into making the jewellery. Also, if for example both tie clips and cufflinks are made, then they can be presented separately or as a set. 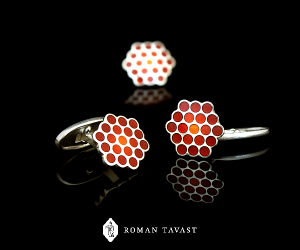 If separately, it is important to know about the recievers habits – some people do not use cufflinks for example. 3) The recipient must be happy to wear the jewellery that has been presented. This last part is usually the reason why full logo is not used in the design of the jewellery: a business partner is unlikely to wear cufflinks that are in fact another companies logo product. Same applies to employees, they might use the tie clip at work and related events, but not while off duty. 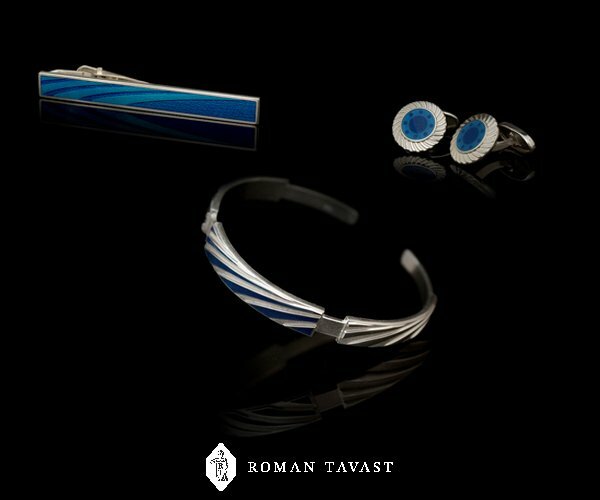 The first example of corporate jewellery set conatins cufflinks, tie clips and bracelets. Designed for ATA Gears, a company that manufacture spiral bevel gears. On the cufflinks, the spiral gear is quite clearly visible. 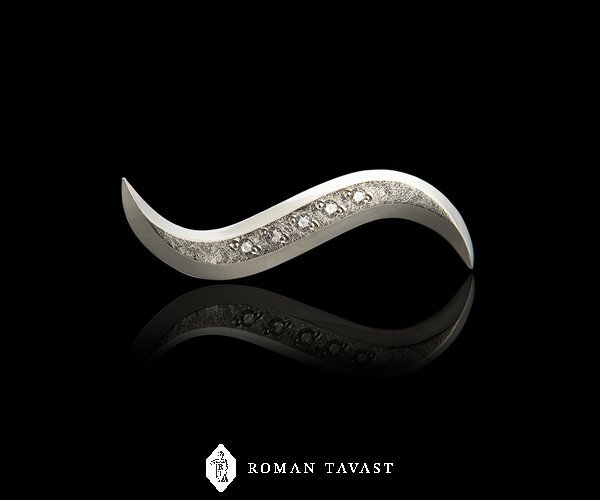 On the tie clip and bracelet only fragments of the spiral can be seen through the enamel. So, the company logo is not used in the design, but the elements of their main product itself connect the jewelry to the company. In the second example corporate jewellery was used for a one off occasion. When a clothing company Sangar had their 50 years anniversary they presented their female staff with brooches. The S shape represents the companies name and the five stones represent 50 years in business. 1) What will the jewellery represent (who will be the possible recipients). 2) Would the recipient be mainly men (cufflinks and tie clips) or women (brooches and neckpieces)? Or both? 3) Will there be variations? Different colours or designs for different recipients? 4) Apart from the logo, are there any other known symbols that can be related to the company? 5) How big is the company (to find out the initial quantity of the jewellery needed)? Based on that info, it is possible to see samples what others have done and then narrow it down to unique design for your company. Then the designers create the first draft. After comments, discussion, and possible changes, the design process is finished and skilled craftsmen start working on the final jewellery. November 6, 2014 November 12, 2014 Roman Tavast LtdComments are off for this post.